Dairy-free, keto fat bombs made from grain-free, keto cookie dough and covered in coconut butter. Zero sugar. Completely keto. Today’s keto recipe is packed with fats to heal your hormones, beautify your hair and strengthen your brain function. We call this a keto fat bomb. What is a keto fat bomb? A fat bomb is a high-fat, low-carb, keto recipe that’s upwards of 85% fat. 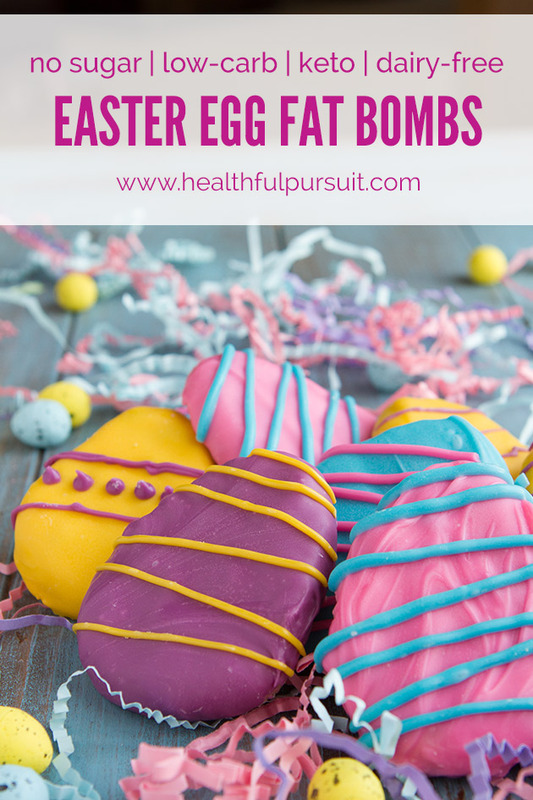 And, because I made this Easter keto fat bomb recipe, it’s dairy-free, too. 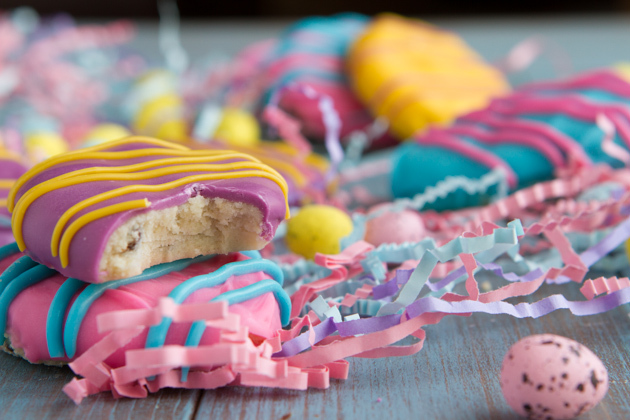 I used Bob’s Red Mill Almond Flour in these keto-friendly cookie dough bites are enveloped in a thin layer of colored keto coconut butter. 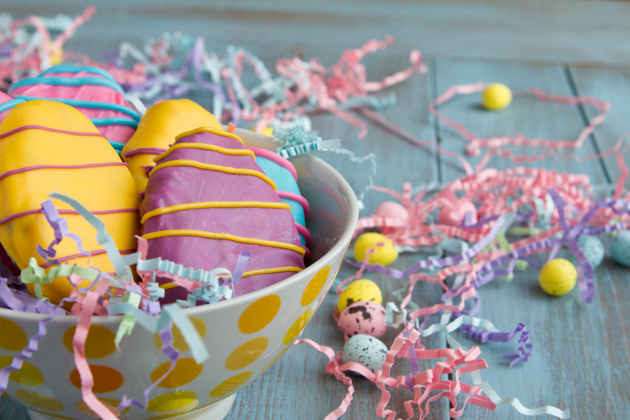 Inspired by the famous cookie dough eggs seen on Instagram. This keto recipe is 100% sugar-free, grain-free, egg-free and as natural as natural can be. I partnered up with Bob’s Red Mill on this keto recipe because their almond flour is a staple in my keto kitchen and, if you’ve been following a Fat Fueled, keto lifestyle for awhile, I’m guessing it’s a staple in your keto kitchen, too. 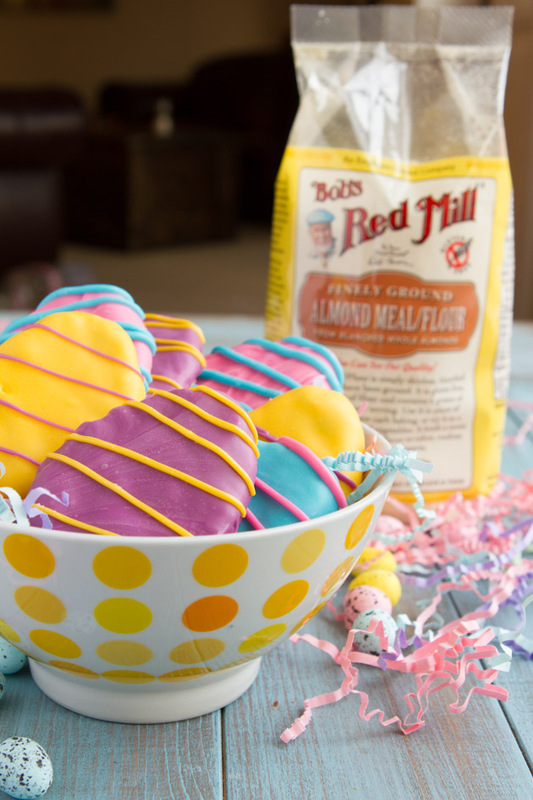 What I love about Bob’s Red Mill Almond Flour is its versatility. It’s a slightly rough-ground flour, making it perfect for recipes that call for breadcrumbs. Or, if the recipe calls for a smoother flour, as in this keto recipe, you can add it to your food processor, grinder or blender to customize it to the perfect texture. 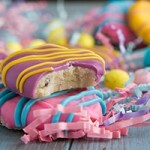 Don’t want the candy-like coating as seen in the photos for these dairy-free, keto fat bombs? You can easily leave it out. Or, coat with some melted keto chocolate if you don’t want to bother with food coloring. Dairy-free keto fat bombs made from grain-free keto cookie dough and covered in keto coconut butter. Zero sugar. Completely keto. Lay parchment paper or a silicon baking mat over a large baking sheet. Add almond flour, coconut oil, vanilla, stevia, and salt to your food processor with an “S” blade. Process until smooth, about 20 seconds. Fold in chocolate chips. Scoop about 1.5 tablespoons and roll into a ball between your palms. Place on prepared lined baking sheet and flatten, shaping into a large egg. Continue with remaining dough. Almond Flour: if you are allergic to nuts, you could try making this keto recipe with Bob's Red Mill Coconut Flour instead. You will likely only need about 25% of the flour called for in this keto recipe. Start with that and add more coconut flour if needed. 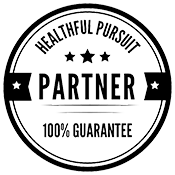 Stevia: the amount you use depends on your tolerance of sweetness. If you’ve been sugar-free for a long time, 5 drops will do. If you’re new to eating sugar-free, 10 drops should do the trick. Sweetener: option to add up to ¼ cup (52 grams) of powdered sweetener of your choice. You could use a stevia baking blend, coconut sugar, or xylitol. Measure amount of sweetener, add to a spice grinder and add to the food processor along with other ingredients. If coconut sugar is used, the recipe is no longer low-carb, keto. Coating: In the video, we coated half the eggs with the coating, but you could do the whole eggs as I did in the photos.